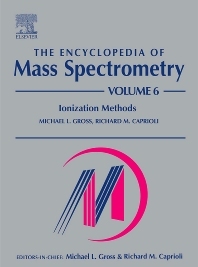 Volume 6: Ionization Methods captures the story of molecular ionization and its phenomenal evolution that makes mass spectrometry the powerful method it is today. Chapters 1 and 2 cover fundamentals and various issues that are common to all ionization (e.g., accurate mass, isotope clusters, and derivatization). Chapters 3-9 acknowledge that some ionization methods are appropriate for gas-phase molecules and others for molecules that are in the solid or liquid states. Chapters 3-6 cover gas-phase molecules, dividing the subject into: (1) ionization of gas-phase molecules by particles (e.g., EI), (2) ionization by photons, (3) ionization by ion-molecule and molecule-molecule reactions (e.g., APCI and DART), and ionization in Strong electric fields (i.e., Electrohydrodynamic and Field Ionization/Desorption). "Ionization in a Strong Electric Field" illustrates the transition to ionization of molecules in the solid or liquid states, covered in Chapters 7-9: (1) spray methods for ionization (e.g., electrospray), (2) desorption ionization by particle bombardment (e.g., FAB), and (3) desorption by photons (e.g., MALDI). Electrospray and MALDI also lead to applications in biophysical chemistry, the theme of Chapter 10. Chapter 11 reconsiders ionization from the view of choosing an ionization method. The range of subjects is from ionization of organic and biomolecules to the study of microorganisms. Michael L. Gross is Professor of Chemistry and Professor of Medicine at Washington University, St. Louis, as well as Director of the NIH Mass Spectrometry Research Resource located at Washington University. 1987: Commonwealth of Massachusetts Pioneer Award, "In Search of the Health Consequences of Dioxin in Our Environment"
Biography Richard M. Caprioli is the Stanley Cohen Professor of Biochemistry and Director of the Mass Spectrometry Research Center at Vanderbilt University School of Medicine. He is also currently Professor in the Departments of Chemistry and Pharmacology at Vanderbilt.